SKU: MB. Categories: Wood Cleaners, Wood Preservatives, Wood Repair. Tags: kill mildew, kill mold, mildewcide, Mold Buster, moldbuster, outlast. Outlast® Mold-Buster™ is designed to stop mold, mildew, and algae growth on paints, stains, coatings and adhesives. Mold-Buster Mildewcide Additive contains a main active ingredient is a broad-spectrum fungicide (IPBC or 3-iodo-2-propynyl butylcarbamate) and does not alter the color of coatings. Mold-Buster Mildewcide Additive is suitable for use in oil and/or water-based coatings. Please Note: Mold-Buster Mildewcide Additive cannot be used in Lifeline Advance Satin / Gloss Top Coat or WeatherSeal Exterior Wood Finish. Eliminate sources of moisture whenever possible. Increase air flow and air circulation. The life of exterior coatings will improve substantially by cutting back shrubbery and overhanging tree limbs. Install gutters to redirect rainwater away from the surface. Interior coatings last longer and stay clean when exhaust fans are functioning properly and air flow is maximized. 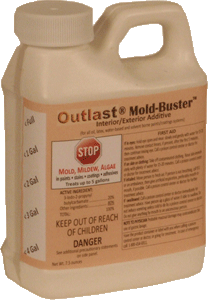 Store Mold-Buster Mildewcide Additive with the lid screwed on tight, away from direct sunlight. There is no specific shelf life indicated by the manufacturer for this product. Mold-Buster is freeze/thaw stable. Outlast Mold-Buster is available for shipment to all 50 states via FedEx Ground. Be the first to review “Mold-Buster Mildewcide Additive” Click here to cancel reply.